As far as most hockey fans are concerned, there’s only one No. 4. But throughout the 1950s and most of the ’60s – that is, before Bobby Orr ever laced up his skates – No. 4 was synonymous with Leonard “Red” Kelly, the original puck-moving defenceman who holds the record for most Stanley Cup wins (eight: four with Detroit, and four with the Leafs) without ever having played for the Montreal Canadiens. Raised on a farm by strong Catholic parents, Kelly worked hard, went to church, loved to dance, and never swore. He preferred to skate “like the dickens” and practice “dang” hard. 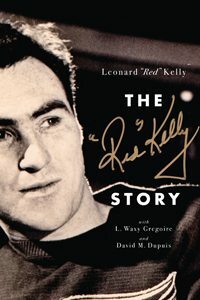 The life story of the Hockey Hall of Famer from the southwestern Ontario town of Simcoe, The “Red” Kelly Story includes details about Kelly’s timely rise from Toronto’s 1947 Memorial Cup–winning St. Michael’s Majors directly into a Detroit Red Wings roster that included the young Gordie Howe and Ted Lindsay, and, a couple of years later, a rookie goalie by the name of Terry Sawchuk. The book, which relies heavily on newspaper reports and a little too much game-related minutiae, also treats readers to several accounts by legendary Canadian sportswriters, including Milt Dunnell, Red Burnett, Jim Proudfoot, and Trent Frayne. As one reads, one can’t help but imagine Kelly as professional hockey’s answer to Forrest Gump. A four-time Lady Byng Trophy winner (given to the NHL’s most gentlemanly player) and the first winner of the Norris Trophy (for the league’s top blueliner), Kelly simultaneously served as a federal MP in Lester B. Pearson’s Liberal government. At the ballot box in the 1962 election, Kelly beat out the Conservative candidate – hockey czar and future convicted embezzler Alan Eagleson – to take the Toronto riding of York West. Kelly was at the centre of the Great Flag Debate of 1964. In his other career, Kelly played in the 1955 St. Patrick’s Day game in Montreal (scene of the so-called Richard Riot), was the first head coach of the expansion Los Angeles Kings franchise in the 1967–68 season, and was coach of the Toronto Maple Leafs in 1976, when Darryl Sittler scored a record 10 points in one game. Add in Kelly’s strong family life – he and his wife, Andra, raised four kids together – and a goodwill hockey trip to Japan and Korea, and he’s proof that good guys can finish first, and that athletes could be role models. 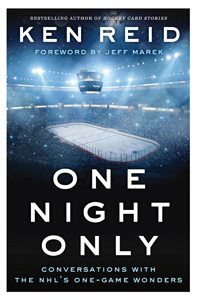 At the other end of the spectrum, you might be forgiven for thinking that a book of stories about guys who made it to the NHL for just one game could quickly turn into a maudlin affair with much crying into beer mugs. You would be wrong. From Ken Reid, the Sportsnet TV host who brought us Hockey Card Stories, comes a brisk and occasionally uplifting volume for hockey nerds everywhere. Reid is himself a hockey nerd of the first order, so tracking down 39 guys to talk about their lives before and after their one game in “the Show” is a labour of love. Though the players’ stories are wildly different, what they have in common (besides harrowing cab rides to airports and last-minute flights almost missed) is their own sense that their one game – which, in many cases, amounted to only a single shift, or about 40 seconds – marked a beginning, not an end. A number of the players can laugh about it years later, but there is also a sense of regret at what might have been. Many of the 39 men Reid profiles went on to productive hockey careers in Europe, achieved success in other fields, or found a way to combine their love of hockey with business. Don Waddell, for example, played one game for the Los Angeles Kings in 1981, then went on to become general manager of the NHL’s now-defunct Atlanta Thrashers. He is today president of Gale Force Sports & Entertainment, parent company of the Carolina Hurricanes. Robbie Irons was in goal for the St. Louis Blues for three minutes in 1968, between legendary netminder Glenn Hall being ejected for bumping a ref and back-up legend Jacques Plante getting his gear on; Irons later had his No. 30 retired by the minor-league Fort Wayne Komets (he also got his own bobblehead). Winnipeg’s Darren Boyko played only one game with his hometown Jets in 1988, but was inducted into the Finnish Hockey Hall of Fame following a stellar 11-year career with HIFK Helsinki. And the most famous one-game wonder of them all – Don Cherry – suited up for one 1955 Boston Bruins playoff game against arch-rivals the Montreal Canadiens, before a broken shoulder effectively ended his shot at an NHL career. It’s easy to hold up Wayne Gretzky or Sidney Crosby as hockey inspiration, but statistically speaking, they are the outliers. The players in this book offer a much more practical guide to making it in life.